If you rely on a point of sale (POS) system to run your business, then you possibly spend time searching for the top 10 best receipt printers in the market. 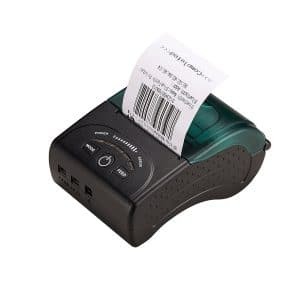 Receipt printer is a device that has become an essential part of modern businesses as it helps to quickly and conveniently print receipts after making a purchase/payment. The device helps to print customer receipts, credit card/ debit card slips, kitchen orders and much more. Over the years, all kinds of receipt printers have been invented and each type will be known for specific attributes. Generally, they fall under thermal, impact and inkjet. Before starting the search for the top receipt printers, you need to look at certain things. What Consider When Looking For a Good Receipt Printer? Type of Printer: Is your business suited with an impact, thermal or inkjet printer? Thermal printers are known for their speed and quietness, impact printers though a bit slow are ideal for wet environments such as the kitchen while ink jet printers produce quality prints (coupons, logos, images …) and are best for retail stores and restaurants. Budget: Impact printers are usually the cheapest but also the slowest followed by thermal printers which require toner or ink and finally inkjet that is pretty fast and of higher quality. Compatibility with POS System: It’s critical to make sure the receipt printer is compatible with your POS system before making a purchase. Also, it should easily connect to the POS system without lots of cable clutter. Other worthy considerations include speed, quality of print, maintenance cost, and brand reputation. Let’s take a look which are the best receipt printers this year. 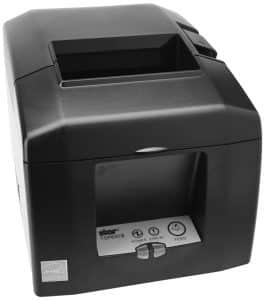 Arkscan AS80USE is a high-speed thermal printer that can print at 250mm/second and produces very minimal noise. 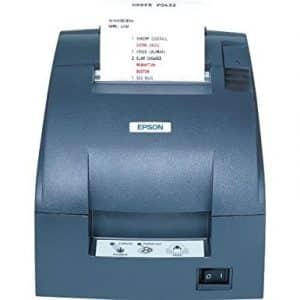 It comes with a 3-in-1 interface allows to print via USB cable, Serial cable or even share a same printer by many different computers via Ethernet/LAN and supports 80mm thermal printing paper. The versatile drop-and-print paper roll installation mechanism allows quick installation of the rolls while the Paper auto-Cutter cuts the receipts on time without using lots of effort. The main demerit about this printer is it doesn’t support Android and iOS. 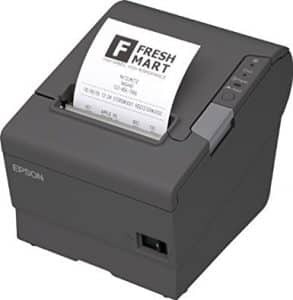 Coming with Ethernet/LAN, USB and Serial ports, the EOM-POS receipt printers can work with many devices. It’s designed for 80 mm thermal paper and comes with an Auto Cutter and Cash Drawer Port for quick operation. The thermal printer is well-known for its long life, decent printing speeds and the reliable printing head. Although it is compatible with all Windows versions and Linux, it doesn’t support Paypal Here, Square, Shopify, Shopkeep, and Clover. 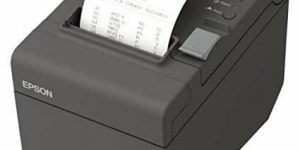 TM-U220B is a high-quality receipt printer that prints in monochrome and comes with a maximum print speed of 6 lps. The dot matrix printer features 9 pins on its head and produces a total of 42 columns while its standard memory is 4 KB. However, this one comes with a serial interface only and has no Ethernet adapter. 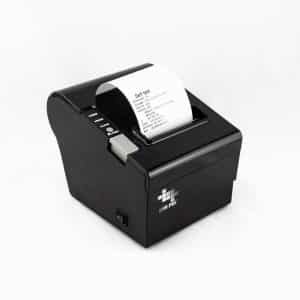 ZKTeco receipt printer is a light, small and compact receipt printer that is targeted at any retail outlet. It supports both android and iOS, including all versions iOS system using App. The compact receipt printer produces very low noise with the print speed of 90mm/sec which is suitable for printing receipts featuring images and logos. The printer head has a lifespan similar to 100km of printed paper and is designed for 58 mm thermal paper which is bought purchased separately. However, it CANNOT support PayPal/Intuit Gopayment/Square Register/ Credit Card Reader/izettle/FileMake Go. 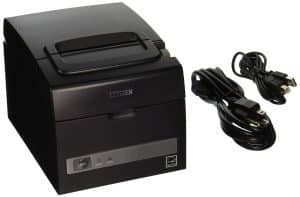 Offering printing speeds of up to 160mm per second, Citizen America receipt printer is fairly fast and is suitable for most applications. 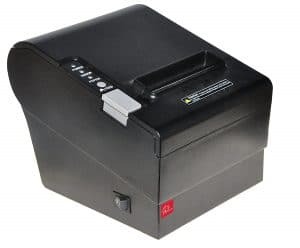 The monochrome thermal printer also comes with a Halogen free housing, durable printing head that will serve you for long (up to 200 km), a built-in cutter and power supply as well as a buzzer. It is also included is a Serial/USB port, save paper function, and Cutter jam release feature. 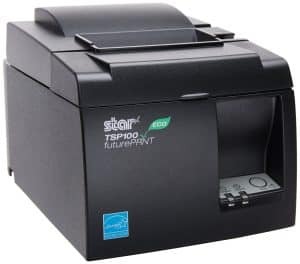 TSP654IIBI-24 thermal printer by Star Micronics is a crowd favorite due to its advanced features and fast printing speed (300 mm/Sec). It is compatible with iOS devices and will work with mobile devices, comes with Bluetooth connectivity. The printer comes with an external power supply and works with a single device at a time. Epson TM-T88V is a top rated printer that is best known for its impressive speeds (up to 300 mm per second). The thermal printer only prints in black, but will serve you well for long courtesy of its durable printer head that will print receipts that span up to 100 kilometers. It also comes with an internal power supply and auto-cutter but. The printer is quite costly than other printers in its range and doesn’t feature a USB cable. Popularly referred to as the Eco-friendly printer, Star Micronics TSP143IIU comes in a small and light size that makes it very portable. It relies on a high-speed thermal printer head to produce quality prints very fast. The thermal receipt printer has a large compartment for paper rolls. It comes with an auto-cutter, USB interface, and a built-in power supply (cables for both USB and power supply included). Epson brand holds bragging rights for being a leading manufacturer of printers. Their ReadyPrint T20 Direct Thermal Printer produces great quality with fast printing, yet its price tag is among the best. It comes with print speeds of 150 mm per second, has a long-lasting and quiet printer head, features a built-in power supply and has an auto-cutter. 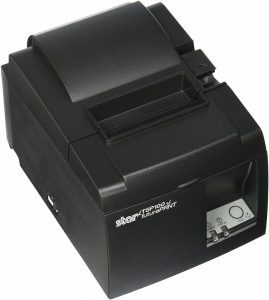 TSP 100 receipt printer by Star Micronics is very popular in the POS market courtesy of its reliable print speed, durable print head and affordability. The monochrome printer prints at speed of 125mm/s and comes with a 203DPI resolution for a receipt printer. It features the innovative Direct Thermal Technology that is renowned for quality, speed, silence and comes with a built-in adapter. The above receipt printers are small, compact and portable, are compatible with most POS systems and are relatively silent. What’s more, the majority of the consumers admire their speed and silence, other love the low-cost of maintenance and durability, while others appreciate the quality and user-friendliness. 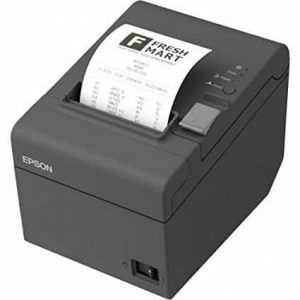 After reading the review on the top 10 best receipt printers in 2019, which one do you think is the most suitable for your business and why so? How about letting us know by sharing your opinion? Here all of above collection are good.The method that you select for receipt printing should minimize your cost and time but the end results should be high on quality. Thanks for sharing this article.